NHM Worldwide is a leading international provider of Natural Progesterone products for pre-menopausal, mid-menopausal and post-menopausal women with a reputation for customer service, reliability, quality and confidentiality. We are proud of our prime position in the market of natural progesterone and related health care products, which we have established over many years in the business. Our focus is clearly on our consumers and how best to serve their needs. This is why we work closely with the WWIS, through which the late pioneer of natural progesterone research, Dr. John Lee, helped countless women in need of his qualified support. We are also the official international distributors of Emerita products, and our pricing structure is as competitive as it gets. In addition to reduced product costs, our fast and efficient delivery service is also one of the least expensive around - just take a look at our prices to see for yourself. To fully appreciate the competitiveness of our prices you have to look at the total cost a sale - including delivery. Although rival companies can offer lower unit costs their initial losses are handsomely recovered at checkout, often with inflated charges for shipping, handling & taxation. We will continue to offer the best products & services at the lowest prices. If that doesn't have you convinced, consider that we ship all UK orders by 48 Hour Express Delivery! 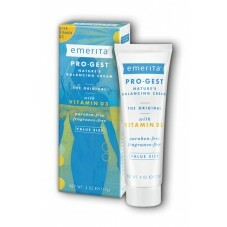 This is the same, great Pro-Gest® Cream formula trusted by women since 1978 for support at midlife now with Vitamin D3. Like all Pro-Gest® Creams, it contains 450 mg of USP Progesterone per ounce (20 mg per 1/4 teaspoon)... as well as 500 IU of Cholecalciferol (Vitamin D3) per 1/4 teaspoon. For external vaginal comfort. This soothing, pH-balanced cream contains supportive botanicals and herbal extracts researched for their reputed ability to support natural balance and comfort. Contains nine key botanical and herbal extracts, including St. Johns Wort, Thyme, Calendula and Tea Tree Oil, in a gentle base of Aloe, Jojoba and Olive oils. Its free of parabens or harsh chemicals. Apply as needed; for external vaginal use. Supplement your daily diet with plant ingredients that have been trusted for generations to aid life's midlife changes. Our midlife balance supplement includes the phytoestrogens Chaste Tree Berry Extract, Dandelion Leaf, Black Cohosh and Red Clover. For generations, women have turned to plant compounds for midlife support. Weve combined them here in a convenient dietary supplement form. Emerita's new and improved paraben-free phytoestrogen formula.